Washing detergent brand, OMO, has partnered with J Walter Thompson to launch what it claims is the world’s smartest clothes peg. 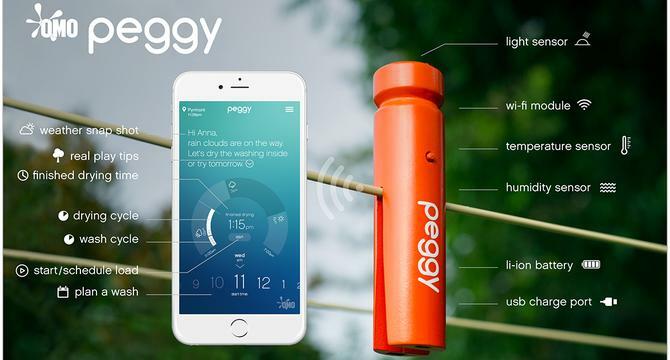 Dubbed ‘Peggy’, the smart peg features light, humidity and temperature sensors, along with a Wi-Fi module, in order to provide consumers with information on the best time to do the washing according to various weather indicators. It combines these features with macro weather data from weather forecasting services as well as the local weather data to provide specific insights on conditions at the user’s location. The forecast weather data is supplied through open-source weather APIs. The peg is synced to a user’s mobile phone and uses push notifications to update consumers of these changes in weather conditions. It also features a USB charging port and longlife in-built battery. Users will see on their mobile screen a weather snap shot, approximate finished drying time, drying cycle and wash cycle timing, and also have the ability to set reminders on when to plan a wash.
OMO said Peggy was part of its ‘real play’ marketing strategy aimed at helping not only lighten the load tor families, but also encouraging active play for children. The peg is in beta and is currently being trialled by several Australian households. The brand has created a short YouTube video to detail how the smart peg works, as well as emphasise its focus on helping families spend more time outdoors together. Unilever laundry and homecare A/NZ marketing director, Paul Connell, said the smart peg came off the back of research that showed parents wanted to spend more time playing with their child, rather than on everyday chores. The research showed that in an average week, Australian families do one load of washing per day, increasing to almost eight loads per week during school holidays. “In today’s complex and hyper-connected world, we believe brands have a responsibility to create and lead for positive change,” he said, adding Peggy would help the brand increase its positive social impact. “OMO’s commitment is to finding ways to help lighten the load for parents and getting children developing to their full potential through play. J Walter Thomas Sydney executive creative director, Simon Langley, said Peggy was a real and practical way to bring the ‘real play’ strategy to life, which fits within OMO’s ongoing Dirt is Good mission. The agency’s group digital creative director, Jay Morgan, added Peggy was an example of how innovative new technologies could be applied within the creative process. “Brands are strongest when they’re not only talking about their purpose, but actively demonstrating it through innovation and new product development,” he commented. A spokesperson said a small quantity of working prototypes had been produced for the initial consumer testing program and OMO hoped to then have a larger release of Peggy.